This book describes the variety of interprofessional education (IPE) programs in both didactic and clinical settings, and how librarians are partnering to further the success of these programs and expand the notion of "interprofessional" beyond the typical health professions. Chapters describe library involvement in planning, development, design, and evaluation of their institutions in the education of a variety of healthcare professionals on teamwork in healthcare, also known as interprofessional care (IPC) in an interprofessional, team-based setting. IPE focuses on topics including understanding the training and roles of various health professionals (physicians, nurses, pharmacists, social workers, mental health practitioners, etc. ), the importance of teamwork, working in healthcare teams, the role of patient safety and healthcare teams, and other areas related to an interprofessional approach to health care. To prepare future health care professionals for work in a clinical setting that increasingly features IPC and to fulfill accreditation requirements, medical and health colleges across the nation have created IPE programs. Just as librarians are involved with other aspects of the education of our students, librarians are involved with IPE. Descriptions and evaluations of this work is being presented at professional conferences, but this is the first book to cover the topic. Interprofessional Education and Medical Libraries: Partnering for Success from the prestigious Medical Library Association provides a brief introduction to IPE and features descriptions of how librarians are involved with IPE at their institutions, paying particular attention to librarians' roles in the planning, design, development, and evaluation of their institutions' IPE programs. 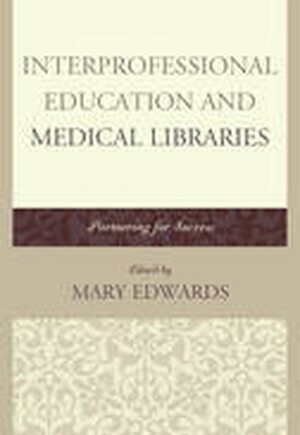 While several chapters focus on the role of the medical librarian in IPE programs, to broaden the potential audience and impact, the book includes other perspectives of IPE. Highlights include content on topics ranging from foundational concepts (history of IPE programs, theoretical and pedagogical foundations of IPE, accreditation, assessment) to case studies from high profile IPE programs and specific examples from practice. IPE programs in both didactic (non-clinical) and the clinical setting are included.